If you're wondering what a Martinez cocktail is, perhaps you should get acquainted with Old Tom gin. Back before "London Dry" was synonymous with gin, in the 19th century, Old Tom was the most popular type of gin. Halfway between the malty flavor of Dutch genever and modern London dry, it was sweetened, possibly to mask the harshness of the pot-distilled alcohol as much as for flavor. In the first half of the 1800s many Old Toms were aged in wood -- not by design but because they were transported in wooden barrels from distillery to tavern. When stainless steel replaced wood in the latter half of the century, Old Tom became something closer to a sweetened London Dry. By the early 1900s, London Dry was the gin of choice, and Old Tom all but disappeared. Old Tom started showing glimmers of life again at the turn of the millennium, when Tanqueray released its Malacca gin. It wasn't quite Old Tom, but cocktail nerds and historians like the great David Wondrich proclaimed it the next best thing. Alas, it was a wee bit ahead of its time, as the cocktail renaissance was still in its infancy, and Malacca only lasted a couple of years (it's since been reissued and is still worth trying). In the middle-aughts, Ransom Spirits and Hayman's each brought an Old Tom to the market; Ransom's was wood-aged, Hayman's was not. Suddenly you could make an Old Tom cocktail 1840s style or 1890s style. Cocktail enthusiasts on both sides of the bar were flush with excitement. A handful of other, lesser-distributed brands popped up in Ransom and Hayman's wake, but that's where the story, for the most part, ended. Until now. The last few months have seen three new Old Toms hit the market, further proof that we are living in a wonderful, wonderful time. And the nicest thing is that all three are quite different from each other, so the whole spectrum of your Old Tom needs can be met. But wait, I hear you ask -- what needs? And what is this Martinez thing you mentioned up top? Right, sorry! The Martinez, first created sometime in the 1860s somewhere in California (the tales of its creation are myriad and none can be verified), was the very first cocktail to include both gin and vermouth, and as such was the forefather of the modern Martini. Mind you, the drink was Old Tom gin, sweet vermouth rather than dry, and maraschino liqueur, so it didn't taste anything like the martini we know today. But hey, our 3.5 million year old hominid ancestors don't resemble Justin Bieber very much, either. And the Martinez is much more pleasurable than Justin Bieber. And most hominids, for that matter. The Tom Collins was also originally made with Old Tom, and it's much easier than the Martinez on modern palates. 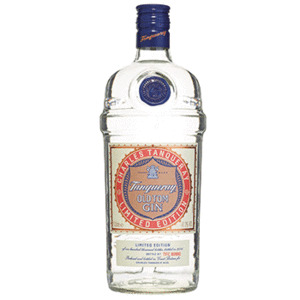 For the historically minded, there's TANQUERAY OLD TOM GIN (47.3% alcohol by volume, suggested retail price $35/1 liter bottle). The recipe comes straight from a Mister Charles Tanqueray, who in the early 1800s founded the company that bears his name. I have no idea how close it is to authentic 19th century Old Tom; advanced distilling techniques probably make it a lot smoother than the original. And this is one smooth gin -- so smooth, in fact, that it's even enjoyable when consumed neat. How many London Drys can you say that about? The botanicals, notably juniper, are all in evidence, and there's a nice lime flavor to it as well. It's not so much sweet as gorgeously rounded, and the finish is on the dry and herbal side. My favorite way to drink it is in an Old Tom martini with a twist of lemon and rather less vermouth than I'd put in a London Dry martini. It goes down easy... a little too easy if you don't watch yourself. N.B. I found the Old Tom pretty similar to Tanqueray's Malacca, and distiller Tom Nichol is apparently keeping mum about how they're different. But they're both worth checking out. The Brooklyn-based GREENHOOK GINSMITHS OLD TOM GIN (50.05% ABV, $45) is wood aged, in the style of earlier 19th century Old Toms -- and in the style of Ransom's Old Tom, which sets a pretty high standard to live up to. This one isn't quite historically faithful. It's aged for a year, far longer than a vintage Old Tom would be, and it's then finished in Oloroso sherry butts, a practice that didn't even start with whiskies until the 1960s. But with a gin this tasty, who really cares? The wood aging gives it a lovely dry, slightly malty flavor with sweet cinnamon and almond undertones. I love it in a gin Old Fashioned or as a Pink Gin. The latter is simply gin and bitters, and because this gin already has a light amber hue from the wood aging, the name isn't quite accurate. Maybe call it a Gold (Tom) Gin? 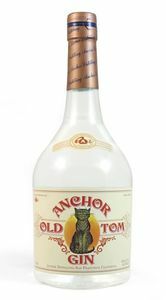 And for a 21st century twist on a 19th century classic, there's ANCHOR OLD TOM GIN (45% ABV, $30). It's pot-distilled and includes, from what I can tell, but four botanicals: juniper, star anise, licorice root and -- are you ready? -- stevia, the natural non-sugary sweetener du jour. Of course, the stevia root is used here and not the powdered stuff you put in your iced tea. But still, it's a pretty interesting move. The combo of the star anise and licorice root with the stevia make it, to my taste buds, quite similar to Sambuca, though with a gorgeous, velvety mouth feel that's much preferable to Sambuca's syrupy density. 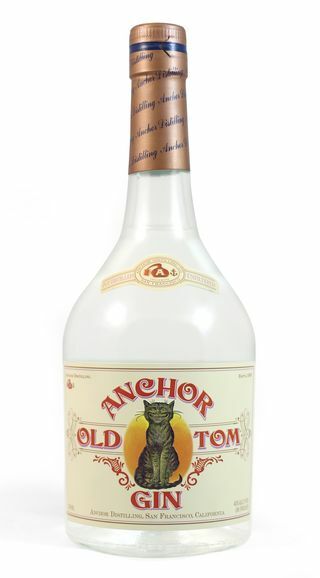 This isn't like any Old Tom I've ever tried, and from what I can tell it's not particularly faithful to vintage Old Tom. But give it a try in a Martinez and you'll be a happy retro-cocktailian. And hey, it's sugar free! Nothing wrong with that.